Arab MK demands that Yisrael Beytenu chairman, Otzma Yehudit representative be barred from 20th Knesset elections. 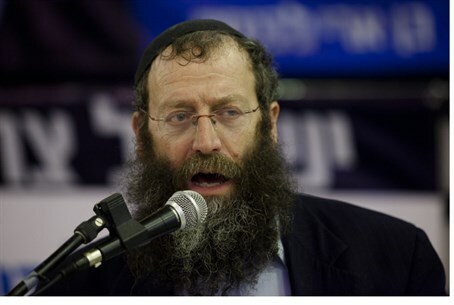 MK Issawi Freij (Meretz) and a group of Israeli citizens who say that they support the rights of Israel's Arab minority have filed a petition against Yisrael Beytenu Chairman Avigdor Liberman and Otzma Yehudit's Baruch Marzel on Wednesday, asking for both to be banned from the 2015 elections. In the letter, penned to Central Election Commission (CEC) Chairman Supreme Court Justice Salim Jubran, the petitioners warn that they "may find themselves as mute victims" who are "vulnerable" to the "damage to the fabric of democracy in Israel and the spread of racist ideology in Israel" due to the two politicians. The petition also notes that most of the signatories are Jewish Israelis. According to the petitioners, Liberman and Marzel have skirted "for years on the edge of incitement to racism against the Arab minority in Israel and against their parliamentary representatives" and added that it "worsened" during the last round of elections, when Liberman's campaign slogan was "No loyalty - no citizenship" in reference to Israeli Arabs. Since that campaign, the petitioners claim, "there has been a remarkable increase in radicalization, culminating in recent months, during which the accused crossed the red lines of racism" and "melted any cloud of doubt about their intentions to harm the Arab population and remove them from the sphere of democratic and civilian life." Yisrael Beytenu responded Wednesday afternoon that the petition is "absurd." "It seems there is no end to the absurd and cynical exploitation of democracy if we have now reached a situation in which representatives of terror organizations in the Knesset have petitioned the Central Elections Committee to disqualify Israel's Zionist party," it said in an official response. Eli Yishai's Yachad-Ha'am Itanu party, under which Marzel is running for Otzma Yehudit in a technical bloc between the two parties, responded by saying that the petition "has no legal basis." "It's even more audacious considering that it comes from people who are collaborators with the enemy," it said. "MK Hanin Zoabi (Balad) should have found herself behind bars for her betrayal of Israel in the Marmara flotilla incident. There are a number of Arab MKs whose natural place is the parliament in Gaza." "We learned about the application only from the media, thereby raising the suspicion that the petition was filed only to 'make headlines' before the elections at our expense," the party added in a later statement to Walla! News. Two petitions in a similar vein have been filed against both Zoabi herself and the joint Arab list as a whole, noting that each has been guilty of supporting terrorism - the latter by including the Balad party. Before the technical bloc was announced, Otzma Yehudit leader and former MK Michael Ben-Ari predicted that a petition against its party would be filed in the CEC, as leftists have done in previous elections, and noted that previous attempts have not succeeded.